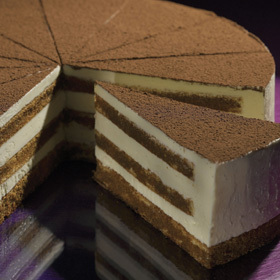 Layers of Soft sponge soaked with espresso coffee & liqueur. Filled with zabaglione cream and dusted with cocoa powder. Mascarpone & sweet ricotta with layers of delicate sponge, topped with wild strawberries and redcurrents set in a strawberry glaze. Layers of liqueur soaked sponge filled with cream, decorated with crushed macaroons, topped with Chantilly cream and whole amaretti biscuits. Shortcrust pastry filled with Chantilly cream and topped with a mass of mixed berries and decorated with a dusting of icing sugar. Large white chocolate covered choux buns filled with a chocolate mousse. Sheer decadence! Moist chocolate brownie covered with an umptious toffee sauce with sprinkles of pecan pieces. Finished with swirls of chocolate sauce. A crunchy butter cinnamon biscuit base, topped with a slice of sticky stem ginger sponge, vanilla American style cheesecake. Smothered in caramel sauce, gingerbread cubes, drizzled with white icing and a scattering of golden chocolate nuggets. A light crunchy gluten-free biscuit base topped with vanilla baked cheesecake finished with heaps of blackcurrants in prosecco sauce. A luxurious creamy vanilla cheesecake covered with juicy strawberry halves and lashings of strawberry sauce all sitting on a crunch gluten-free digestive biscuit base. You can’t beat a good fudge cake and this one is guaranteed to get your customers talking! Not only is this a traditional chocolate fudge cake but it is also gluten-free! This tall and fabulous 9’ chocolate sponge is filled, topped and side coated with a rich mouth-watering chocolate fudge. A traditional shortcrust pastry case with a zesty lemon filling, topped with a generous helping of meringue and baked to perfection. Bringing in the harvest was never this scrumptious (till now) The best flavours of the season all put together for a Harvest Cake you won’t soon forget. Two layers lovely moist spiced apple, pineapple, parsnip, sultanas, and carrot. Vegan & gluten free cake filled and topped with lime flavour frosting, hand sprinkled with pistachios and caramel flavoured sauce. Two layers of rich chocolate cake sandwiched together and encased in green mint flavour icing, finished with rosettes, a sprinkling of crumbed milk chocolate, sticky chocolate sauce and chocolate flavour mint chocolate sticks. Gluten-free chocolate biscuit base topped with luscious layers of milk and dark orange chocolate truffle. Finished with a sprinkling of golden sugar crystals. A chocolate lovers dream! Indulgent layers of moist red velvet cake smothered with a rich chocolate fudge coating. Side masked with a cream cheese frosting & coated with white chocolate padgets.